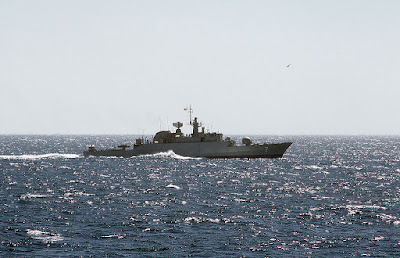 I got to thinking about a discussion we had as part of Midrats yesterday in which we talked about the attack on a Saudi frigate in the Red Sea by some sort of high speed boat or something. I think it began about the 10:09 point. 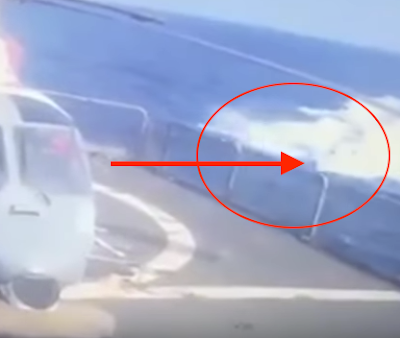 As I viewed the video I noted what appears to be the bow of the attack vessel appearing out of the sea spray. In the screen shot of the video, I've circled the area and placed an arrow pointing at what I believe to be the bow. 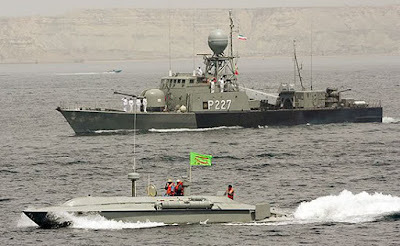 If I were an Iranian naval or IRGC officer and I had a cool toy, I might want to try it out somewhere against an enemy - not the "A" team probably but perhaps against the "SA" team. So I wonder - was this an application of something akin to what they used in that practice/publicity attack on the fake carrier? 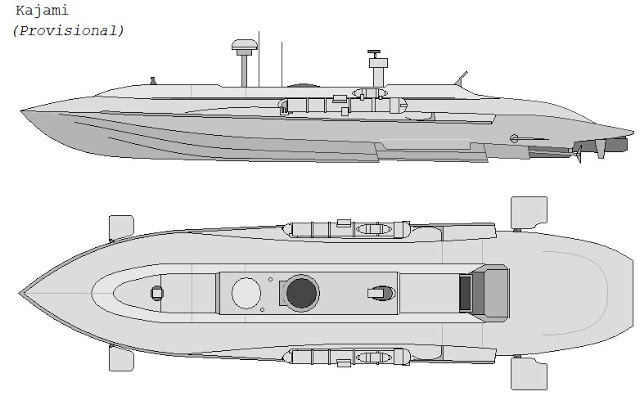 Or was this some sort of hybrid attack using something like that Taedong B semi-submersible or one of its ilk? Or did they steal someone's ski boat? Given the amount of spray around the attack boat, I have an inclination toward some sort of semi-submersible whose bow came out of the water when it hit the frigates bow wake, but I am open to suggestions. Is your head swimming in the 2nd month of the Trump Administration? While we are distracted with intramural politics, the world keeps moving and other nations move forward. How are the national security and international order reacting to the change in USA leadership? From NATO to China and Russia, what signals are coming from and going to the new American government? 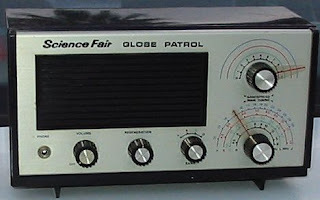 No guests this Sunday from 5-6pm Eastern, just our quarterly free-for-all with the show co-hosts, Sal from "CDR Salamander" and EagleOne from "EagleSpeak." 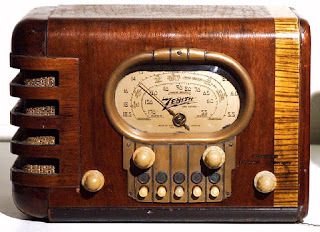 If you'd like to join the conversation, feel free to call the switchboard number at the top of the show page, join the chatroom, or if you can't make the live show, you can send you questions via twitter to @cdrsalamander or @lawofsea. Candy, played by Natalie Parks, was hard-boiled in her own way. She never compromised her femininity but she did know how to use a gun and didn't hesitate to use when it was necessary. She didn't take any guff from the guys--the good guys or the bad guys. With a snappy comeback, she could take anybody's head off. Candy was fearless, never hesitating to go wherever she needed to solve a case from the lowest dive to the classiest night club. Candy worked hard to get her goon. Friday Film: Early Drones - From 1942 "U.S. Navy TDN-1"
Remotely piloted aircraft have been around longer than you might think. The bodies of 74 drowned African migrants have washed ashore in Libya, leading to speculation people traffickers removed the motor from their boat during the treacherous Mediterranean crossing. It is claimed the refugees making the treacherous trip to Europe from Libya came into difficulty after human traffickers intercepted their vessel at sea and stole its motor at gunpoint, according to the Libya Observer. However, a spokesman for Libya's Red Crescent said the circumstances of the drowning was unknown. Let's suppose that the report of the theft of the motor is not true - even then, putting people in unsafe boats while charging them for transport to "safety" is just as criminal. The problem needs to be solved on the shore and that means putting an end to those who trade on the hopes of these desperate peoples. The problem does not lie in the European community, but in the Third World hellholes these migrants/refugees are fleeing. Sometimes, after a day of scanning various media and electronic things, I have to go to Weekly World News (THE WORLD'S ONLY RELIABLE NEWS), for real fake news (and they are proud of it), for instance, EARTH TO COLLIDE WITH NIBIRU ON OCTOBER 17, 2017! collide with Earth on October 17, 2017 or 17/10/17. The Nibiru collision with Earth in 2017 has been predicted for a long time, but astrophysicists, cosmologists and astronomers around the world have now come to a consensus that Earth will indeed collide with the planet, which lies just outside Pluto. 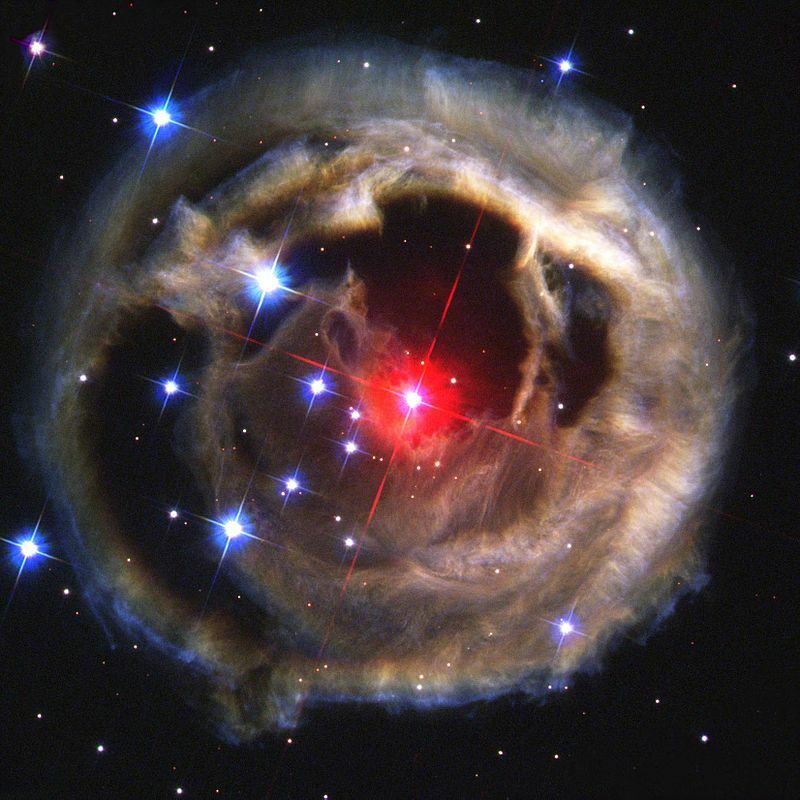 Nibiru, in Babylonian Astronomy translates to “Point of Transition” or “Planet of Crossing,” especially of rivers, i.e. river crossings or ferry-boats, a term of the highest point of the ecliptic, i.e. the point of summer solstice, and its associated constellation. The establishment of the Nibiru point is described in tablet 5 of the Enuma Elish. Its cuneiform sign was often a cross, or various winged disc. The Sumerian culture was located in the fertile lands between the Euphrates and Tigris rivers, at the southern part of today’s Iraq. Natural disasters are accelerating exponentially and astronomers believe that they are being caused by Nibiru coming closer and closer to Earth. I guess we'll all have a ring-side seat. You'd think those alleged "NASA scientists" would be going more public with this sort of information. The wars in Syria and Iraq—perceived to be driven by Shia Iran’s hegemonic ambitions in the Arab world—also frame the narrative the Sunnis throughout the region use to bolster their argument that if the Islamic Republic of Iran had its way, the government would rule every Sunni-dominated Arab country. This fear has reached new heights in recent years, after Iran’s Islamic Revolutionary Guards, the most militant part of the state’s security apparatus, became heavily involved in Iraq, Syria and Yemen. Rather, the Sunnis see the Shia’s primary motivation as tied directly to their theology, and that any political gain in the process is an added bonus. This is the widespread belief among Sunnis across the Middle East, from Syria and Lebanon to Yemen. 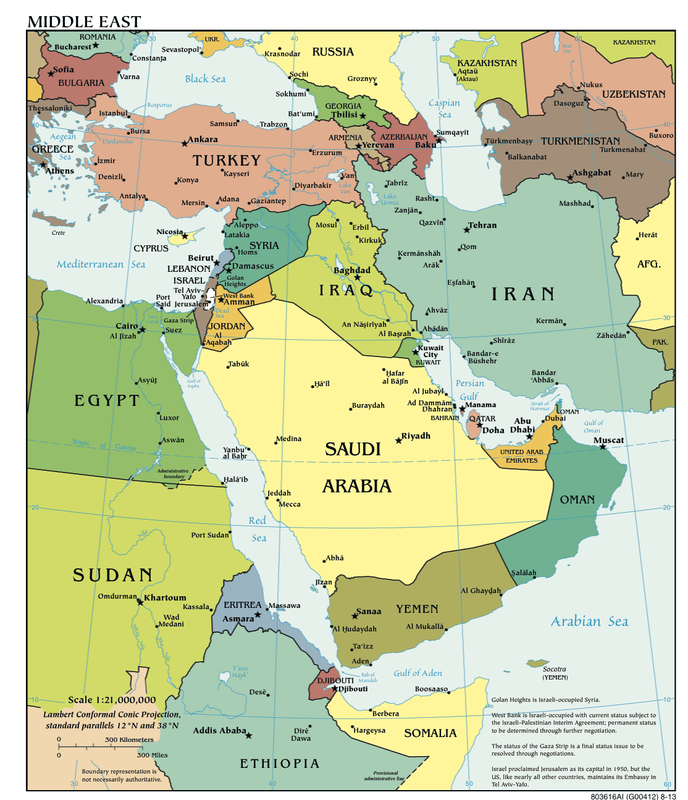 Although the Shia-Sunni divide has persisted for centuries, the Arab uprisings dramatically escalated the conflict for several reasons. First and foremost, religious identity has become more relevant to Arabs than in recent decades. The notion of citizenship—being an Iraqi or a Syrian—became less important, due in part to the virtual collapse of states and governments. Second, the political leadership of Shia Iran and its Sunni neighbors, chiefly Saudi Arabia, have openly fanned the flames of sectarian rivalry in their pursuit of power and territory. As I say, well worth the read. 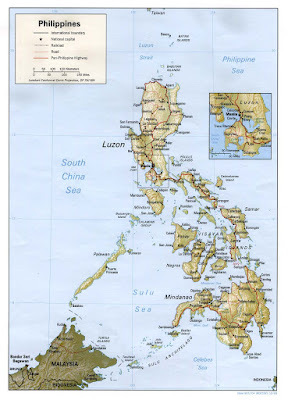 tip, killing a Vietnamese crewman and abducting six others including the vessel's captain, the Philippine coast guard and the ship's owner said Monday. Coast guard spokesman Armand Balilo said the Vietnamese coast guard reported that the MV Giang Hai, with 17 crewmen on board, was attacked by pirates Sunday night about 20 miles (31 kilometers) north of Pearl Bank in Tawi-Tawi, the Philippines' southernmost province. Personnel of the Philippine coast guard, police and marines found the ship had drifted near the province's Baguan Island. Upon boarding the vessel, they found 10 Vietnamese sailors alive and one dead. Pham Van Hien, head of the safety department of Pham Hai shipping company, the owner of the cargo ship based in Vietnam's northern port city of Hai Phong, said the captain was among those abducted. 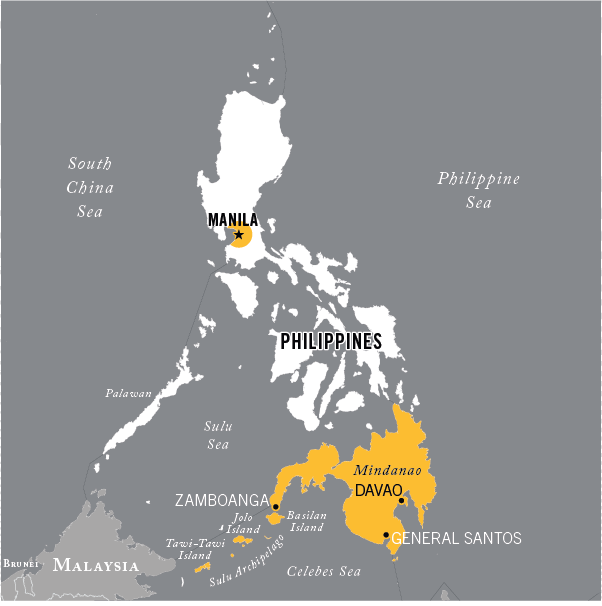 The attack occurred while the vessel was transporting 4,500 tons of cement from Indonesia to the Philippines, he said. 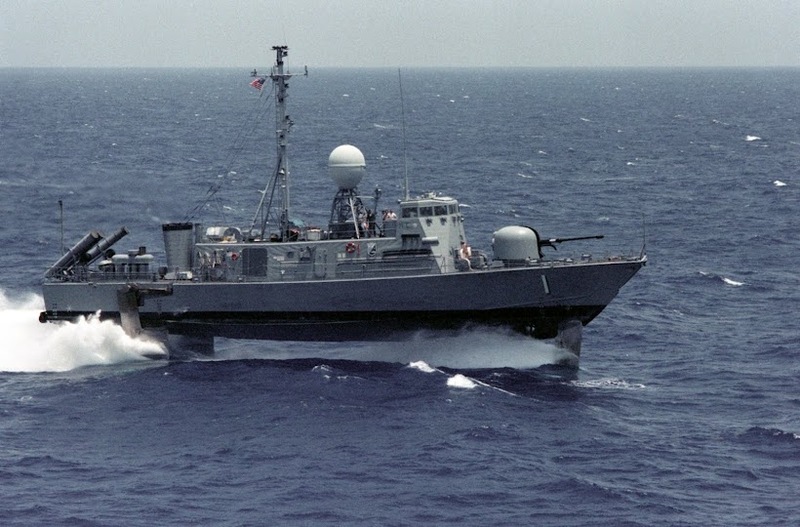 The Houthi boat that attacked and hit a Saudi frigate Jan. 30 in the Red Sea, reported earlier as a suicide boat, was instead carried out by an unmanned, remote-controlled craft filled with explosives, the US Navy’s top officer in the Mideast said. “Our assessment is that it was an unmanned, remote-controlled boat of some kind,” Vice Adm. Kevin Donegan, commander of the Bahrain-based US Fifth Fleet and head of US Naval Forces Central Command, told Defense News in an interview here Saturday. The attack on the frigate Al Madinah appears to be the first confirmed use of the weapon which, Donegan said, represents a wider threat than that posed by suicide boats and shows foreign interests are aiding the Houthis. The unmanned boat was likely supplied by Iran, Donegan said. “I don’t know that it’s Iranian-built, but I believe that it’s production in some way was supported by Iran,” Donegan said. Why would Iran do this (in addition to just making trouble)? I had thoughts earlier Missile Attacks Off Yemen and the Iran- Saudi Proxy War for Oil Shipping Chokepoints and Fun with Iran: Iran "Naval Ambitions". 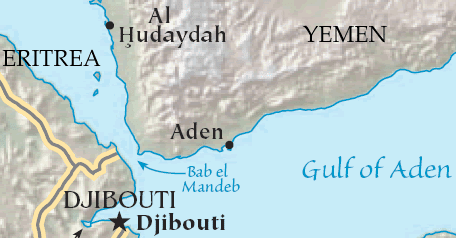 Closing the Bab el-Mandeb Strait could keep tankers in the Persian Gulf from reaching the Suez Canal and the SUMED Pipeline, diverting them around the southern tip of Africa. Red Sea, Bab-el-Mandeb Strait and Gulf of Aden Commercial vessels in the region of the Red Sea, Bab el Mandeb Strait and the Gulf of Aden should operate under a heightened state of alert as increasing tensions in the region escalate the potential for direct or collateral damage to vessels transiting the region. These threats may come from a variety of different sources such as missiles, projectiles or waterborne improvised explosive devices. 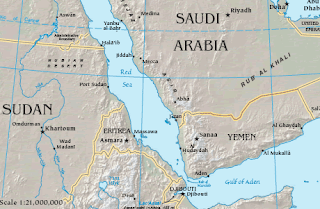 Houthi rebels claimed responsibility for an 01 October attack on a UAE vessel. . .
and so to the regular ONI report. 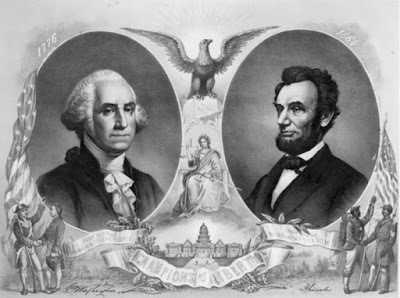 Saturday Is Old Radio Day: Cavalcade of America "Abraham Lincoln" and "Washington and the Crown"
On Midrats 19 Feb 2017 -Episode 372: Andrew Jackson’s Navy; Now More Than Ever? Please join us at 5pm EST on 19 Feb 2016 for Midrats Episode 372: Andrew Jackson’s Navy; Now More Than Ever? Since his election in November, the administration and several articles have suggested Donald Trump is a new Andrew Jackson whose portrait now hangs in the Oval Office. What might that mean for the Navy? 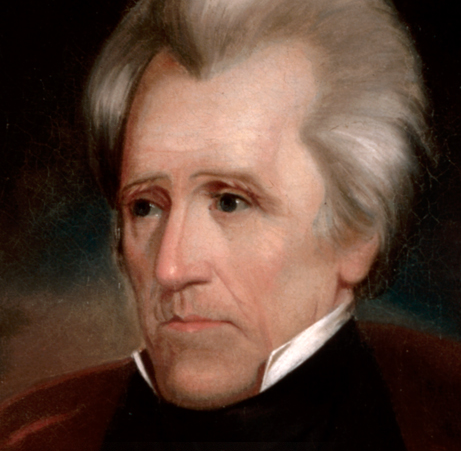 How did Andrew Jackson approach his Navy and what lessons can we draw from that? Our guest for the full hour for a discussion of an understudied part of our naval history and what it could mean for the current administration is returning guest Claude Berube. 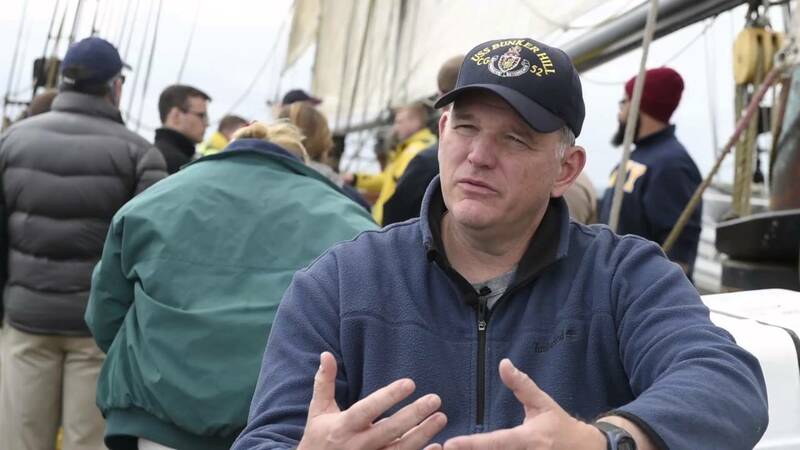 Claude is the Director of the Naval Academy Museum and has taught in both the Political Science and History Departments at the Naval Academy. He has worked in the U.S. Senate, as a maritime studies fellow at the Heritage Foundation, as the head of a terrorism analysis team for the Office of Naval Intelligence and as a defense contractor. 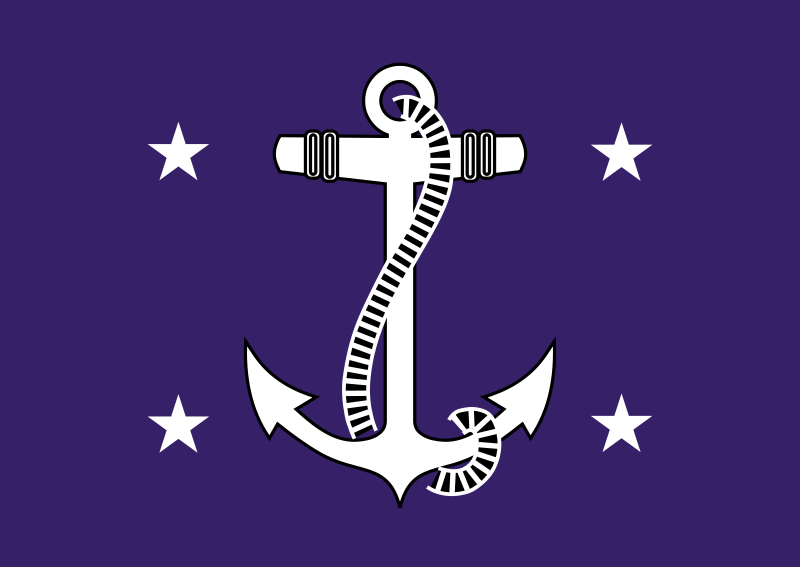 An intelligence officer in the Navy Reserve, he deployed with Expeditionary Strike Group Five in 2004-05. His articles have been published in Orbis, Vietnam Magazine, Naval History, The Washington Times, Jane’s Intelligence Review, Naval Institute Proceedings and others. He’s also written or co-authored five books. He’s completing his doctoral dissertation through the University of Leeds. that the amount of American support for NATO could depend on whether other countries meet their own spending commitments. “America will meet its responsibilities,” he said, but he made clear that American support had its limits. In his speech to NATO defense ministers, Mr. Mattis repeated a call made by previous American secretaries of defense, for European allies to spend more on their militaries. His comments on Wednesday give teeth to President Trump’s expressed skepticism about the alliance. What’s more, Mr. Mattis went further than his predecessors in apparently linking American contributions to the alliance to what other countries spend. “If your nations do not want to see America moderate its commitment to this alliance, each of your capitals needs to show support for our common defense,” he said. 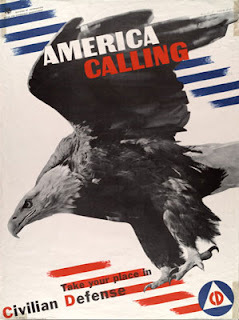 I think I hear Euro heads exploding - their social welfare spending does not include sufficient defense of their nations - because they long have counted on the U.S. to have the laboring oar. However, the U.S. has carried some of them for over 70 years and that is not how partnerships are supposed to work. I know previous SecDefs have made the same point - but Secretary Mattis, well, he seems to have a way with words. By social welfare, I include the idea that a primary function of a state is to protect its citizenry. 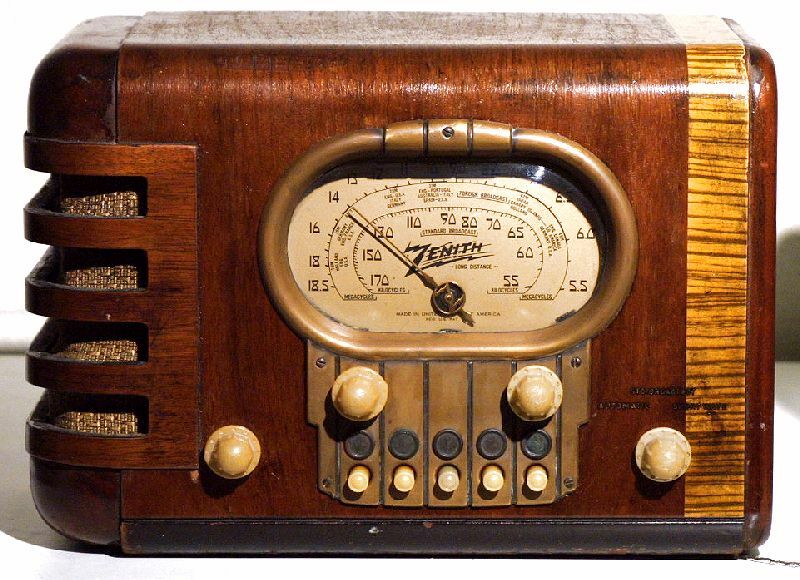 Next, how about a discussion of those sea lines of communication the U.S. is protecting? How about some load sharing? 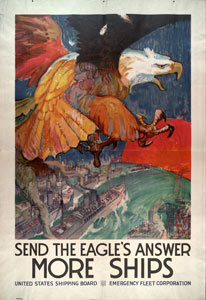 That being said, we, of course, properly should thank France for using its carrier and carrier air as an ally. Iranian Fake Navy News: "Navy Repulses Pirate Attack on Iranian Vessel in Bab-el-Mandeb"
For several years I've had some fun with the elaborate claims made on behalf of the Iranian navy's apparently single-handed war against "Somali" pirates claims that follow a cookie-cutter format with minor variations as to the number of pirate vessels involved. One common thread in these reports has always been the claim that the pirates seem to concentrate on Iranian shipping - which is interesting because no other country reports any such attacks in the area since major anti-piracy programs - both naval and private security - have been in place. 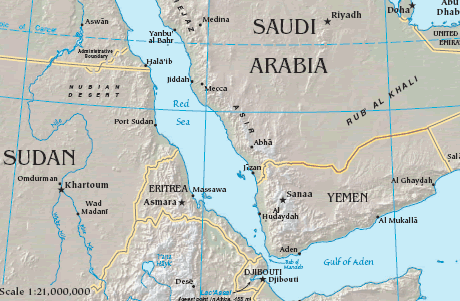 Iran’s naval forces saved one of the country’s trade vessels from a massive pirate attack in the Bab-el-Mandeb Strait, which links the Gulf of Aden to the Red Sea. 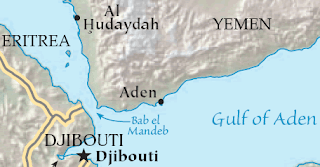 The Navy’s 44th flotilla of warships, which patrols the Gulf of Aden waters in an overseas mission, saved the trade vessel when Somalian pirates tried to hijack it. 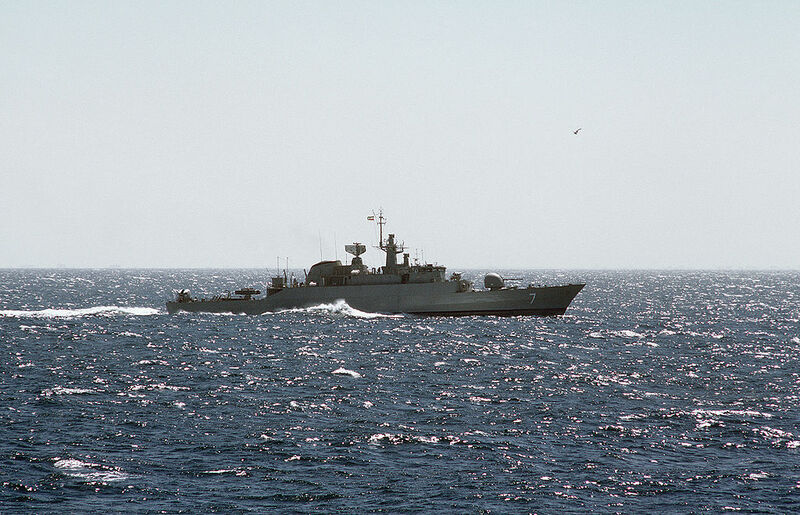 The pirates, equipped with modern and expensive vessels such as refueling ships, launched the attack on the Iranian trade vessel on board 11 speed boats. The timely presence of the naval flotilla forced the pirates to flee the zone. An interesting aspect of this version is the claim of the alleged pirates possessing "modern and expensive vessels such as refueling ships." 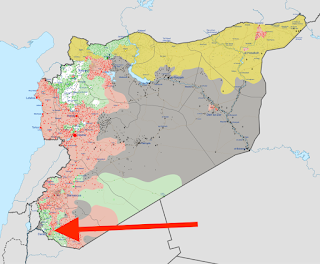 Can't keep track of who is fighting whom in the former state of Syria? It's nice to have a guide through the maze of groups like ISIS, JTS which became HTS, etc. One of the best guides is the gang at Long War Journal, especially Thomas Joscelyn. against Syrian regime forces in the southern city of Daraa. The assault was led by two suicide bombers who detonated their vehicle-borne improvised explosive devices (VBIEDs) in the regime-controlled neighborhood of al Manshiyeh. Daraa, which lies just several miles from Syria’s border with Jordan, has long been divided between the insurgents on one side and forces loyal to Bashar al Assad on the other. HTS has posted photos (seen below) on social media from the fighting in Daraa, including an image of one of its “martyrs.” HTS identified the suicide attackers as Abu Riyan al Muhajir, a Jordanian, and Abu Muhammad al Ansari. The use of suicide bombers is telling. Although HTS has tried to obscure the role al Qaeda plays in its operations, “martyrdom” attacks are one of al Qaeda’s signatures. Other Islamist groups allied with al Qaeda in Syria have, by and large, abstained from carrying them out. Abu Bakr al Baghdadi’s Islamic State, which rivals HTS, is prolific in its use of suicide terrorists. But al Qaeda has been far more selective, only using the tactic in key operations. For example, a number of “martyrs” were deployed during the battle for Aleppo late last year. Their appearance in Daraa likely indicates that HTS has deemed the offensive to be especially important, for one reason or another. Of particular interest are the first three entries in the "Warnings and Advisories" section, Part 2 of the message. 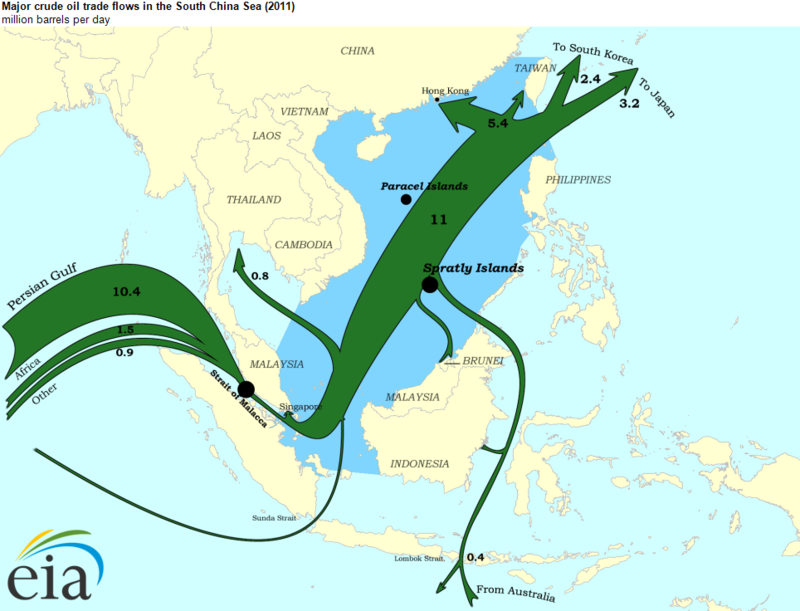 Also worth noting is that the kidnapping of ship crews and others continues off Nigeria. . . is the title of a radio drama series produced and aired by CBC Radio from July 1980 to June 1983. While primarily a supernatural/horror series, Nightfall featured some episodes in other genres, such as science fiction, mystery, fantasy, and human drama. One episode was even adapted from a folk song by Stan Rogers. Some of Nightfall's episodes were so terrifying that the CBC registered numerous complaints and some affiliate stations dropped it. 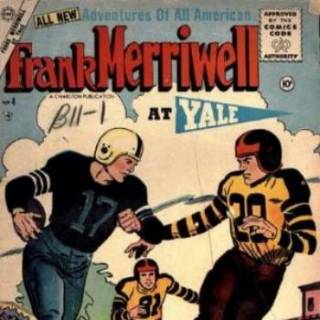 Despite this, the series went on to become one of the most popular shows in CBC Radio history, running 100 episodes that featured a mix of original tales and adaptations of both classic and obscure short stories. security infrastructure. Now is a good time to review, "Who is who in the zoo" and what exactly they do. In the alphabet soup of organizations, how do the NSC, NSA, CIA, DOD, DIA, DHS and DNI all work together - and in competition - to enhance national security? Though everyone likes to bash bureaucracies, they are important and are only as good as those who populate and lead them. Our guest for the full hour to help us navigate the swamp the "blob" lives in will be Loren DeJonge Schulman. 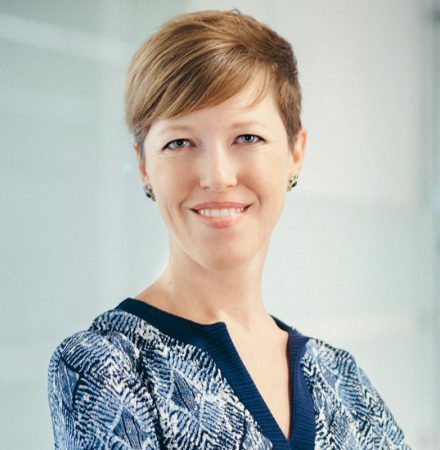 Lauren is the Deputy Director of Studies and the Leon E. Panetta Senior Fellow at the Center for a New American Security. She most recently served as the Senior Advisor to National Security Advisor Susan Rice. Before returning to the White House in 2013, she was Chief of Staff to the Assistant Secretary of Defense for International Security Affairs. She served as Director for Defense Policy on the National Security Council staff from 2011­–2012 and prior to that as a special assistant to Secretary of Defense Robert Gates. She is a Texan (the obnoxious kind), mom to the most awesome pizza loving two year old ever, and spends too much time on twitter. Join us live if you can by clicking here. Or you can pick the show up later by clicking that link or by visiting either our iTunes page or our Stitcher page. Like as lot of line officers, I have done my share of teasing the Supply types, but we couldn't do without them. Update: Congrats to the Dookies. 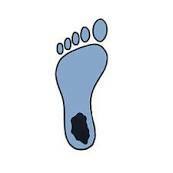 Ah, well, round 2 is March 4 at the Heels home court. Battlefield commanders face many scenarios requiring fast decisions—attacking an enemy position, evacuating injured warfighters, navigating unfamiliar terrain. Each situation pushes leaders to make quick yet informed choices. To enhance these decision-making capabilities, especially for small-unit leaders, the 2nd Battalion, 6th Marines (2/6) —“The Spartans”— recently held a weeklong exercise called Spartan Emerging Technology and Innovation Week at Camp Lejeune, North Carolina. The event, also called Spartan Week, featured various training technologies—from quadcopters to augmented reality—developed with support from the Office of Naval Research (ONR) to accelerate the development of decision-making skills. 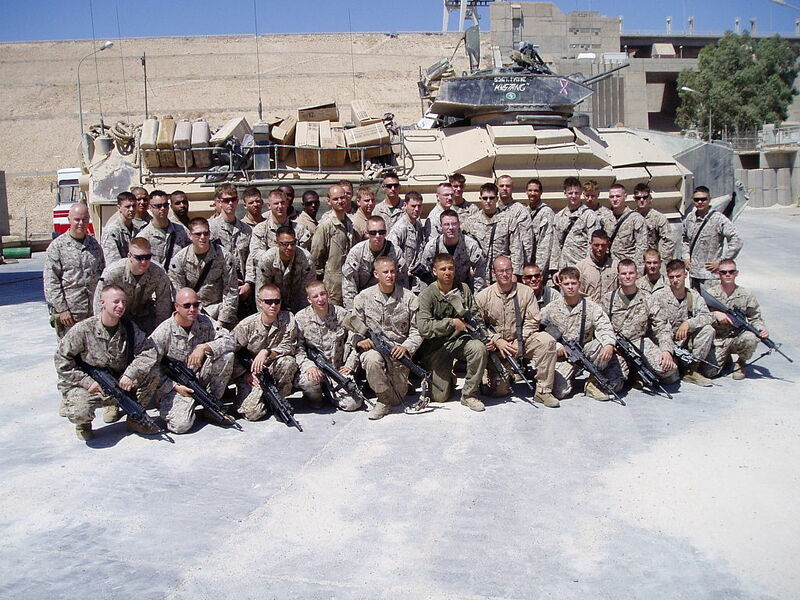 During Spartan Week, Marines used several ONR-sponsored technologies. These included the Interactive Tactical Decision Game (I-TDG) with an associated augmented-reality headset, the Augmented Immersive Team Trainer (AITT) and a quadcopter-based system for surveying and modeling terrain quickly. I-TDG is a web technology-based application that allows Marines to plan missions and conduct “what if” tactical-decision games or simulation-based exercises. It supports maps and multimedia tools and links to ONR’s HoloLens augmented-reality headset. AITT comprises a laptop, software and battery pack, and helmet-mounted display—and can support forward-observer training in live field environments. It employs augmented reality technology, which inserts virtual objects into a real environment, to create realistic tactical scenarios—including friendly and opposing ground vehicles, aircraft and battlefield effects such as explosions from mortar shells and artillery. To rapidly develop terrain models to support these technologies, Marines were trained to operate a prototype, quadcopter-based terrain-mapping system. Two Camp Lejeune training sites were flown over and mapped out, and the resulting imagery was used to build terrain models for the training systems. Steinhauser said Camp Lejeune’s Spartan Week was a success and that another event will be held at another location in early 2017. 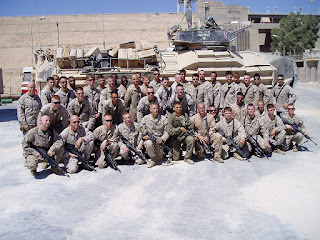 Perhaps the real measures of success, however, are endorsements from Marines who participated. “The Spartan Week technology enabled all Marines, from squad leaders to riflemen, to evaluate their ability to make fast decisions,” said Cpl. Fredrick Zuberer. “Marines tend to focus on using their bodies as weapons, but the most important weapon is the mind. Spartan Week helped sharpen that weapon beyond just pulling a trigger. All of which ought to remind us that many of our great military leaders, while lacking the modern tech that ONR provides, cut their teeth is wars fought before the wars for which they became famous - nearly all the major leader of both sides in the U.S. Civil War fought first in the Mexican War, Washington fought in the French and Indian War, etc. While I doubt that anything matches the pace and chaos of real combat, it can only help young officers to gain experience without actual risk to troops in the field. 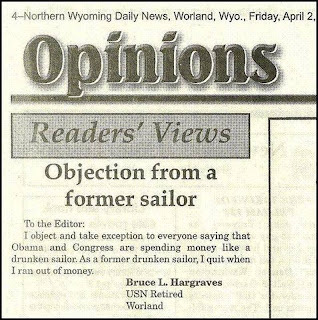 There will be no rest for the next Secretary of the Navy. 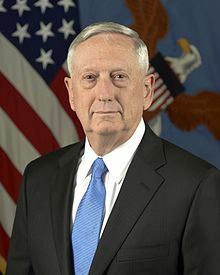 He will need to lead his Navy and Marine Corps as they continue to engage in the Long War against expansionist Islamic extremism, while at the same time come up with the best way to respond to the new direction and guidance coming from President Trump and Secretary of Defense Mattis. From China, to Russia, to Europe, the Islamic world to South America and India on one side of the house, to Congress, academia, and industry - what are those subjects tha the needs to tackle first, which need to be put on a slow boil, and which ones need to be thrown over the transom? We have for the full hour to discuss this and more, returning guest James Holmes, PhD. Dr. Holmes is a professor of strategy and former visiting professor of national security affairs at the Naval War College. A former U.S. Navy surface-warfare officer and combat veteran of the first Gulf War, he served as a weapons and engineering officer in the battleship Wisconsin, engineering and firefighting instructor at the Surface Warfare Officers School Command, and military professor of strategy at the Naval War College. He was the last gunnery officer to fire a battleship’s big guns in anger. Jim is a Phi Beta Kappa received his BA from Vanderbilt University and completed graduate work at Salve Regina University , Providence College, and received his PhD at the Fletcher School of Law and Diplomacy at Tufts University. His most recent books (with long-time coauthor Toshi Yoshihara) are Strategy in the Second Nuclear Age and Red Star over the Pacific. Jim has published over 25 book chapters and 200 scholarly essays, along with hundreds of opinion columns, think-tank analyses, and other works. Join us live (for a pre-Great Big Professional Championship Game treat) if you can by clicking here. Or you can pick the show up later by clicking that link or by visiting either our iTunes page or our Stitcher page. "Iran confirms new missile test, says it does not violate nuclear deal"
paragraph or related to the activities described in paragraph 3. Paragraph 3 of Annex B of resolution 2231 (2015) calls upon Iran not to undertake any activity related to ballistic missiles designed to be capable of delivering nuclear weapons, including launches using such ballistic missile technology. Effective to 2023 or maybe earlier. Iran's defense minister said on Wednesday it had tested a new missile but this did not breach the Islamic Republic's nuclear accord with world powers or a U.N. Security Council resolution endorsing the pact. "The recent test was in line with our plans and we will not allow foreigners to interfere in our defense affairs," Defence Minister Hossein Dehghan told Tasnim news agency. "The test did not violate the nuclear deal or (U.N.) Resolution 2231." A U.S. official said on Monday that Iran test-launched a medium-range ballistic missile on Sunday and it exploded after traveling 630 miles (1,010 km). Iranian Foreign Minister Mohammad Javad Zarif said on Tuesday that Tehran would never use its ballistic missiles to attack another country. Hmmm. The question facing the UN is whether the missile that was fired was "nuclear capable" - if so, that's a clear violation of Resolution 2231, despite Iran's preemptive denial of that fact. Note that Resolution does not even come close to suggesting that "nuclear capability" refers somehow to the current capacity of Iran to load a nuclear warhead onto such missile. I would assert that if anyone - Russia, US, China, North Korea, Pakistan or others has a nuke that could fit the missile now or if Iran could, with or without the help of some other rogue state could develop that technology, Iran is in violation of the Resolution. Which leads to question number 2, does Iran's assertion that its missile is, essentially, "for defensive purposes only" matter? No, that's not part of the Resolution as I read it. Under a council resolution that endorsed the historic nuclear deal with Iran, Tehran is barred from developing missiles designed to carry nuclear warheads. Any violation of that resolution could trigger a snapback of sanctions that were lifted under the nuclear agreement, opening up the Iranian economy to investment and opportunities. Now, who is going to move to reinstate the sanctions? And how do you enforce it? 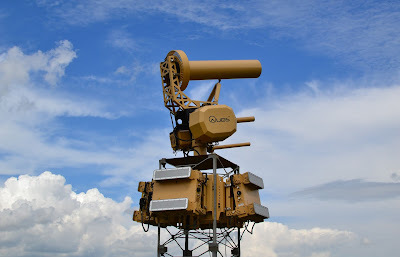 Aviation Week noted AUDS Counter-drone System First to Achieve TRL-9 Status Following Successful Deployment with U.S. Forces. Video of AUDS in operation here.